Hujiang EdTech (“Hujiang”), China’s leading online education company has recently held the launching ceremony of its new online English teaching brand Hitalk in Shanghai. Tailored specifically for adult English learners, Hitalk has received over 98% positive feedback after being launched only three weeks ago. 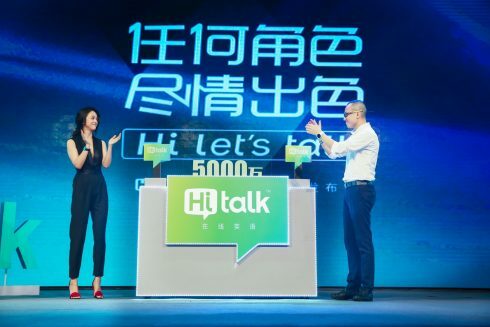 At the event, Arnold Fu, also presented an over 7 million USD scholarship fund on-site with Tang Wei to encourage online English learning under its new brand Hitalk. Hujiang is the largest online education platform in China with more than 150 million users. Leveraging its rich teaching resources including global teachers and online courses, the launch of Hitalk could help further retain its large group of users by meeting the needs of adult users. “I don’t live in an English-speaking country, if I were able to practice with native speakers, I could speak good English,” said Hitalk user Zhao Shuang, who, like many other English learners, finds that traditional language learning and tests don’t help them learn. “The learning process achieved by Hitalk is closer to the natural native language acquisition, as it uses situational dialogue. Hitalk integrates data analysis technology, intelligent adaptive learning, and real-world role play to realize situation-based learning. Its welcoming engaging platform helps to bring together global teachers and Chinese English language learners,” said Arnold Fu.